By default OpenCart 2 uses the standard mail PHP function to send emails. To improve your emails delivery you might consider setting up your store to use SMTP for all outgoing mail settings. This can greatly improve the mail delivery and reduce the bounce rate of your transactional emails. Additionally, the SMTP option allows you to use not only your own mail SMTP server but an external mail service such as Mandrill. For large stores which generate a large volume of emails we highly recommend to setup your store with SMTP to improve the delivery rate and avoid having your emails filtered as spam. 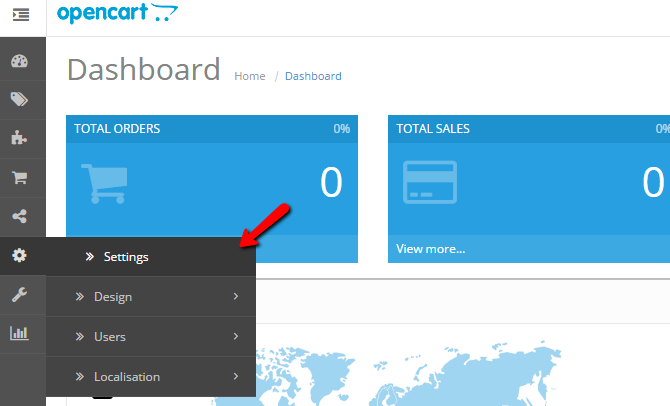 To configure OpenCart 2 SMTP settings, please login your admin Dashboard and refer to the settings section from the main navigation menu. From the Stores List click the edit button and refer to the Mail tab. In case you would like to use the standard PHP mail function you do not need to configure the SMTP settings on this page. In case you would like to set an additional email that will receive all notifications from your store you can set it in the Additional Alert E-Mail field. If you need to have several emails configured, please separate the email addresses with commas. In order to configure your OpenCart 2 to send all emails via SMTP please select the SMTP option via the drop down menu and set your SMTP settings below. SMTP Hostname - This is the domain name or the IP address of your SMTP server. If you use the local SMTP server of your hosting account you can input localhost. SMTP Username - In most cases this should be your email address name. In case your SMTP server uses a different SMTP username than your email address, please contact your system administrator for the correct credentials. SMTP Password - In most cases this should be your email account password. In case your SMTP server requires separate login credentials, please contact your system administrator for the correct credentials. SMTP Port - The default SMTP port is 25, please consult with your SMTP server system administrator or documentation in case your SMTP server uses a different port. If you do not have an existing email account yet you can always create your first email account via your cPanel following our tutorial on How to Create and Manage emails in cPanel.